At the second annual South American Homebrewers Cup (2ª Copa Sudamericana de Homebrewers), a wise man pointed out to me that even though we were on the opposite end of the world from the place he called home, there’s something about homebrewing that makes you want to grow out a healthy beard. This sabio was none other than Denny Conn, who during his trip to Santiago, Chile, made quite an impact, not just with his knowledge, but with his cheerful, laid-back, friendly attitude on life. Few choices could have been more appropriate than to invite Denny to an international competition and conference focused on sharing goodwill in a region with some serious rivalries. This year’s edition was a revival of a conference that began in Uruguay in 2014. Homebrewers in Norteamérica and Sudamérica share much in common, but there are some notable differences. The most obvious is that throughout Latin America, homebrewing is commonly viewed less as a hobby than as a launchpad to going pro and starting a brewery. In the six years I’ve lived in Chile, I’ve tried countless beers made by people who brew tiny batches at home—anywhere from 50 to 200 liters—and then sell that beer in stores, at festivals, at bars, and to friends. Most of it comes in bottles, but some is dispensed from kegs. Some might attribute such an approach to the romanticism of Latino culture, or of Western culture in general. Indeed, following your dreams and doing what you want to do is a big part of the picture. However, having witnessing the reality of low wages alongside a relatively expensive hobby, it’s clear that many do it to either break even or earn a little extra cash here and there. 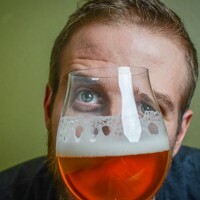 Homebrewing’s relative expense makes the hobby considerably less popular than in the US, with estimates ranging anywhere from 600 to 2,500 homebrewers in Chile, a country with a population of 17 million. Access to ingredients and equipment varies wildly across South America. Chile and Argentina grow wheat and barley, which are malted and consumed in the local market and even exported abroad. Sourcing malts can be trickier and pricier in other countries. When it comes to hops, Argentina is the only country on the continent with its own hop industry, but it exists almost exclusively for the local beer market. That’s a shame because Argentina has some interesting and unique hop varieties that show off their mostly British and German heritage. From what I’ve gathered from talking with homebrewers across South America, Chile has the best combination of access, availability, quality, and prices. While Chilean homebrewers don’t have access to as many hop varieties as American homebrewers do, Chile imports hops from all over the globe, and many of those that are in vogue show up in stores across this long, skinny country. In spite of these differences, there is one thing that every South American brewer has in common: they almost universally depend on dried yeast. Liquid yeast has had difficulties getting a foothold here because of transportation logistics and demand, and when it does get here, it’s several times more expensive than dried varieties. Consequently, reusing yeast for multiple generations and making yeast starters are unfamiliar practices for many South American homebrewers. Water on the world’s wettest continent varies just as much as it does in North America. In Patagonia, people have been quick to praise their pure water sources, while those in other locations can have incredibly hard water similar to Burton-on-Trent. Thanks to such vast differences, many brewers have learned what styles work best for their water profiles, and it shows. Tasty dark beers are popular in central Chile, while crisp lagers dominate down south, where the water is as soft as the winters are cold. In spite of these differences, brewing is still brewing, and the hobby draws the same curious, good-natured people that it does elsewhere. Homebrewing is growing, and with it, more events and spaces to exchange ideas and enjoy camaraderie. Homebrewers happily take their latest experiments to meetings and get-togethers to gain feedback from their fellow homebrewers. As a homebrew living in Chile, I’ve been particularly happy with the wide range of malts found throughout the five homebrew stores in the capital of Santiago. For starters, you can get high quality, local Patagonia Malt at a very affordable price, with several base, caramel, and specialty malts available. When something special is needed, or if you just want another flavor profile, many different malts are imported from Europe, including Weyermann, Muntons, Castle, Dinegmans, and The Swaen. Despite this ample selection, it’s curious to note that North American malts are not imported to Chile. The internet has made sourcing equipment simple in most of the US and Canada, but it remains a problem for many homebrewers in South America. Even staple items such as auto-siphons, keg connections, and even Champagne-style crown caps can be difficult to procure. What does make it here is limited in quantity, expensive, and often in stock for only a short time. These challenges, combined with significantly lower wages, lead to impressive ingenuity. Engineering types make custom systems, while those who have a trip planned to the US (or know someone who does) take advantage of the opportunity to stock up and bring back what they can. 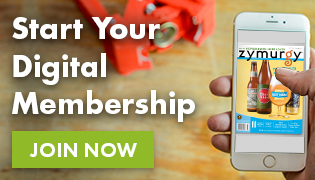 Another popular option is buying gear from abroad as a group to get a bulk discount. In the end, there are myriad options for getting an effective homebrew system in place. It just requires some resourceful ingenuity. The conference, held July 23, 2017, addressed topics familiar to homebrewers around the world, including hop usage, mash techniques, and recipe design. Talks also helped attendees learn to contribute and promote their national homebrew associations. Between talks, people ventured out of the acoustically smooth auditorium to find stands selling beer. Vendor highlights included up-and-coming yeast lab Kayta, which specializes in wild Chilean yeasts, and Weyermann, which highlighted the new malts they are exporting to the country. The quirkiest and most unexpected (but in hindsight quite brilliant) vendor was a full-service barber who cut hair and trimmed beards on the spot (there we go with the beards again!). The competition turned out to be a great success considering that everything was planned and coordinated in just six months. In the end, 82 beers competed from five countries. 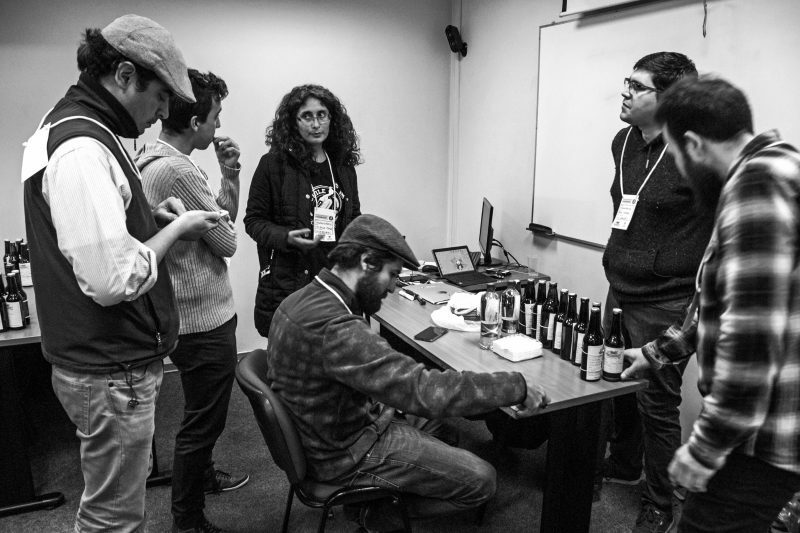 Each participating country other than Chile held an internal competition to send its highest-quality beers to compete abroad. As this year’s host nation, Chile had 35 participating beers, followed by Argentina with 19, Uruguay with 10, and Brazil and Peru each with 9 homebrews. Eighteen judges from these countries, along with Denny Conn from the US, were tasked with awarding 12 bronze medals, 12 silver medals, and 7 gold medals. 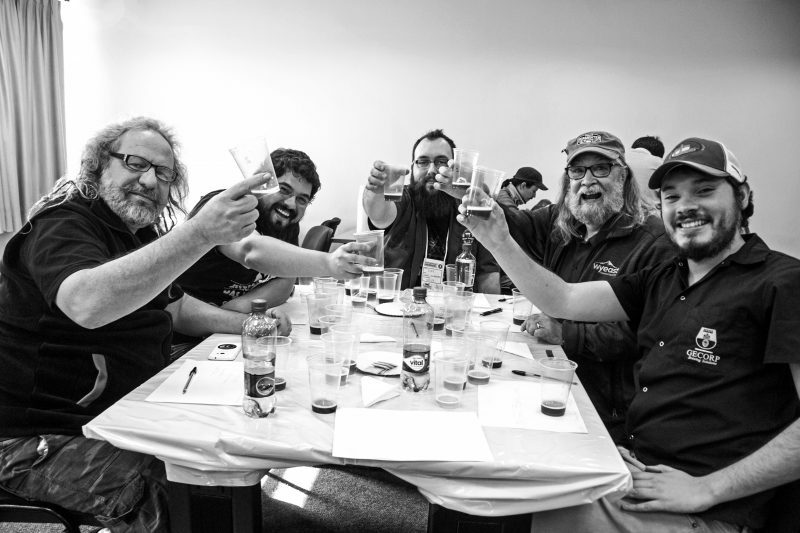 The best homebrewer award went to Argentina, to homebrewing duo Juan Manuel Santos and Tomás José Avalos for their fruit beer, witbier, and American IPA. For their delicious brews, they were awarded a Pegas Evolution counter-pressure bottle filler. Best-of-show was awarded to Brazil and Rodrigo Campos Oliveira’s fruit beer, which highlighted classic tropical fruits from the Amazonian nation. For this grand prize, a 500-liter (4.2-barrel) batch of this beer was brewed at Alameda Brewing Company in Santiago in October 2017. On a personal note, I was honored to win two silver medals for my (in Denny’s words) “far-out” and “weird” beers. For my fruit beer, I submitted a completely experimental beer that was the product of several different trial batches using different corn varieties and concentrations until I got the recipe down to what I wanted: 58 percent blue and purple corn, with the rest equal parts Pilsner and wheat malts. In order for it to compete in the fruit beer category, I added fresh passionfruit to this light, refreshing beer. I also brewed a crisp witbier with 1/3 Pilsner, 1/3 light wheat malt, and 1/3 flaked wheat. What turned the recipe on its head was a wild Chilean yeast that just happened to have a phenolic flavor profile similar to German hefeweizen and Belgian wit yeasts. The night after the conference, we gathered at Cervecería Spoh, a brewery located in an industrial neighborhood of downtown Santiago. In addition to the house beers, the conference’s collaboration wheat ale with blueberry and raspberry was made available for free to the more than 100 people who showed up to celebrate with freshly made quesadillas, hamburgers, Chilean panqueques (crêpes), and live music. The night’s festivities were a blast, with homebrewers from all over the world sharing their passion for good beer with one another. Many phone numbers, email addresses, and great ideas were exchanged. After the awards had been presented, Denny offered a moving speech in which he thanked everyone for such wonderful experiences and an unforgettable trip. He was not the only one who was impressed—during the week, all of those who got the chance to hang out and get to know this down-to-earth, long-haired legend of a homebrewer were blown away by just how much of a nice and cool guy he was. As Denny finished his speech, his biggest fans—judges from Argentina and Uruguay—delivered their own riff on the familiar football chant: Olé, olé, olé, olé, Denny Conn, Denny Conn! 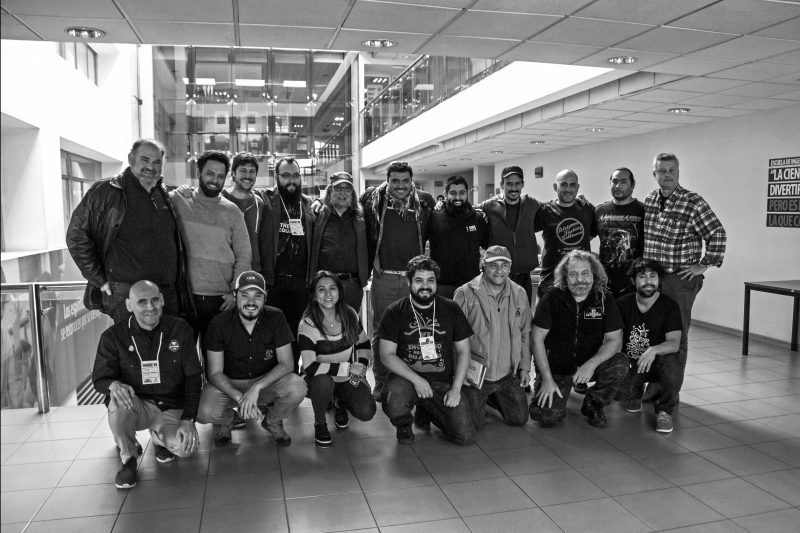 If all goes according to plan, next year’s competition will face quite a challenge to surpass the fun of the second South American Homebrewers Cup. Garrett Garfield lives in Santiago, Chile, and is the founder of La Espera Mead. Readers are invited to connect with him on Instagram and Facebook.